All organic ingredients - Always. 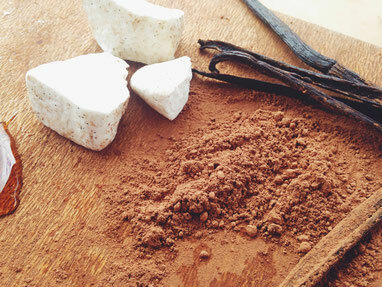 Cacao Butter which we source from Bali, is an important component of chocolate. The first stage in processing Cacao is to grind the Cacao Beans to form a uniform paste. This paste has a natural fat content of roughly 50%. This fat is then separated from the Cacao Paste to obtain pure Cacao Butter. (Agave Tequilana Weber Azul) Agave Syrup or Agave Nectar as it is also known, is obtained from the sap in the hearts of the agave or maguey plant. One of the unique characteristics of this natural sweetener is that it is slowly metabolized. It has a very low Glycemic Index (GI) compared to sugar, honey, maple syrup or other sweeteners. Our Organic Raw Agave Syrup is produced in Jalisco, Mexico, This is the best agave syrup produced in the region using traditional methods including low-temperature evaporation below 40º. The chief chemical component in the beans is vanillin. The pods also compose of numerous traces of other constituents such as eugenol, caproic acid, phenoles, phenol ether, alcohols, carbonyl compounds, acids, ester, lactones, aliphatic and aromatic carbohydrates and vitispiranes. • Coconut palm sugar, harvested by hand, in Indonesia. • Salted butter made in Australia. 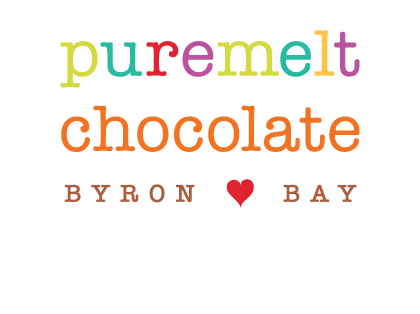 Puremelt then add from the range of other exotic ingredients listed here to create the tastes that Sarah is becoming famous for, such as the mouthwatering ‘Davidson plum & ginger’ – pieces of fresh Byron Shire Davidson plums nestled alongside home-grown fresh ginger caramalised in Indonesian coconut palm sugar and then lovingly encased in puremelt chocolate to make a decadent treat that is actually good for you. • Cinnamon powder from Sri Lanka. • Vanilla powder from India. • Cayenne Pepper powder from India. • Coriander powder from India. • Cumin powder from India. • Ginger powder from India.